Little Sunshine's Playhouse maintains an identity and brand image of unrivaled distinction in preschool and early childhood education. Our facilities serve as a castle for a 'Once Upon A Time' experience that enables each child to develop their imagination. Imbued throughout with old-world appeal, our facilities are professionally designed to maximize each child's personal experience. 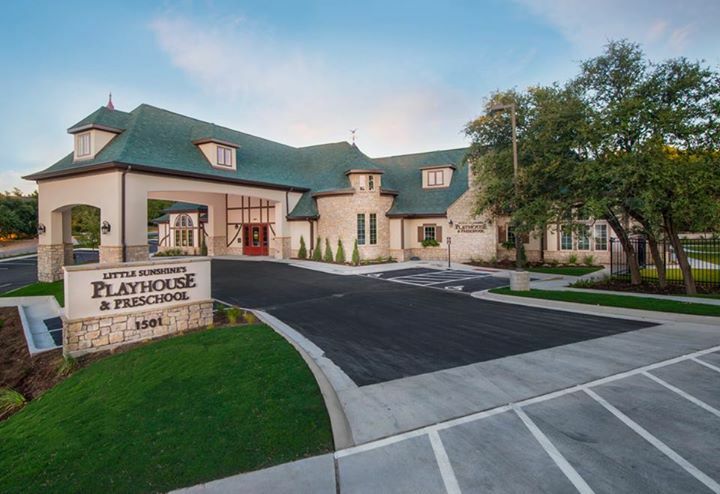 In conjunction with enhanced interiors, Little Sunshine's Playhouse features a theater stage, a landscaped nature center conducive to healthy, outdoor play and a variety of customized, age-appropriate playground equipment. We offer a master planned and Reggio Emilia inspired curriculum, Creatively Shine, which is based off the newest research and trends to prepare young children to enter their educational career equipped with cognitive, social, emotional, physical and language skills. We use industry-leading technology in our programs to provide exclusive services such as our secured Kiddie Cams that allow parents to watch their child via a smart phone or computer, our LuvNotes system which is an electronic communication system that allows teachers to send parents personalized notes, pictures and videos of their children during the day, a Red Carpet morning drop-off service and secured entry. These unique characteristics and distinctive services differentiate Little Sunshine's Playhouse as the premier preschool and child care concept. Year after year, classrooms of our children graduate into their next level of education. Our graduates are equipped with academic and social accomplishments and have a deep sense of self-worth and philanthropy. It is our hope that our students and their families will hold their experiences with Little Sunshine's Playhouse close to their heart for years to come.